I went to visit a friend of mine recently for a long overdue catch up over a mug of coffee. This particular friend, a lady with a widespread knowledge of the New Forest, comes from a long established commoning family whose home was an integral part of their dairy farm. Although the dairy business no longer exists the house retains those features and dimensions that were built to compliment an agricultural lifestyle. These elements differ markedly from the homes of the ‘Country Living’ style residences one sees in glossy magazines because, in many cases, they are still utilised and maintained by working farming folk who value practical application over cosmetic interior design. There is plenty of evidence, both inside and out, in such dwellings to tell of a life maintained by agricultural or silvicultural activity. Apart from the presence of heavy machinery parked in the yard, in the form of tractors and other farming or forestry implements, there is usually the obligatory stock-trailer that most commoners own and very little sign of gentrification to the property. On my arrival at my friend’s holding I noticed evidence of log splitting activity, which was indicated by a small pile of logs and faggots that had been loaded into a wheelbarrow ready for transportation into the house. A large axe lay inertly beside the chopping block, but its weight and exquisitely sharpened edge belied its potency for slicing the thick rounds of tree branch into smaller, more manageable quarters. 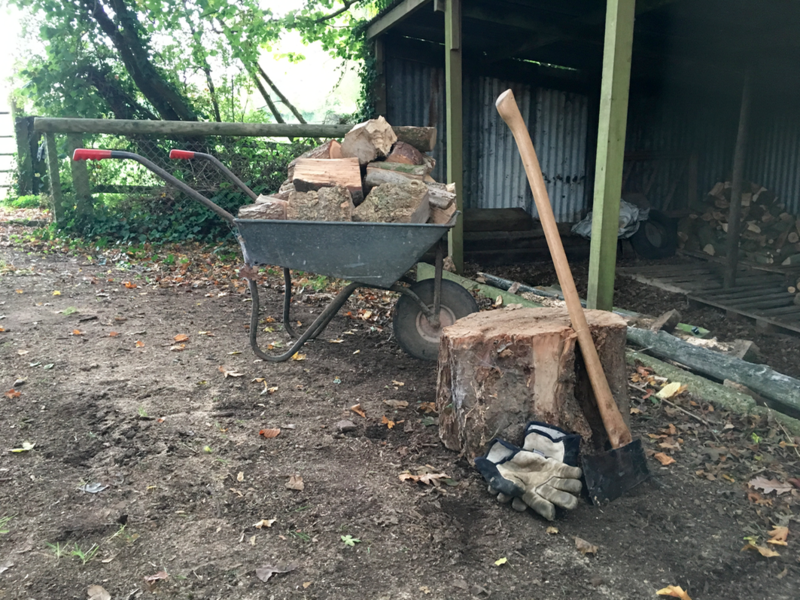 Those of my readers who have ever tried chopping logs with an axe will understand why it is said that wood warms you twice; once when you are cutting it – as it is physically demanding work – and again when you are burning it. My friend, a retired lady of diminutive stature, grinned broadly when I enquired who had been so industrious in cutting up the logs, and she immediately took the credit. Her independence, which was instilled in her at a young age, gives her a great sense of achievement and, she says, ‘keeps her going’. Indeed, she’s the kind of person who is more likely to offer help than to ask for it. Her kitchen is what I like to think of as a proper commoner’s kitchen with a commodious wood-fired range for cooking on, drying wet overalls and warming outdoor boots, or providing comfort to newborn or sick animals. Its perpetual labours in generating heat, fed by perpetual labours in chopping wood, ensure that the kitchen offers a cheerful greeting to those who enter. This warm reception is matched by the wood stove in the sitting room, which purrs happily as it breathes out heat tinged with smoke. Apart from the warmest of welcomes, the congenial company and quaint surroundings I enjoy when visiting, I always look forward to the coffee she serves, which is the best caffè latte in the district. As I settle in beside the wood stove for a long overdue chat, I join the ranks of creatures including calves, foals and puppies that have drawn comfort from the warmth of this working Forest home. 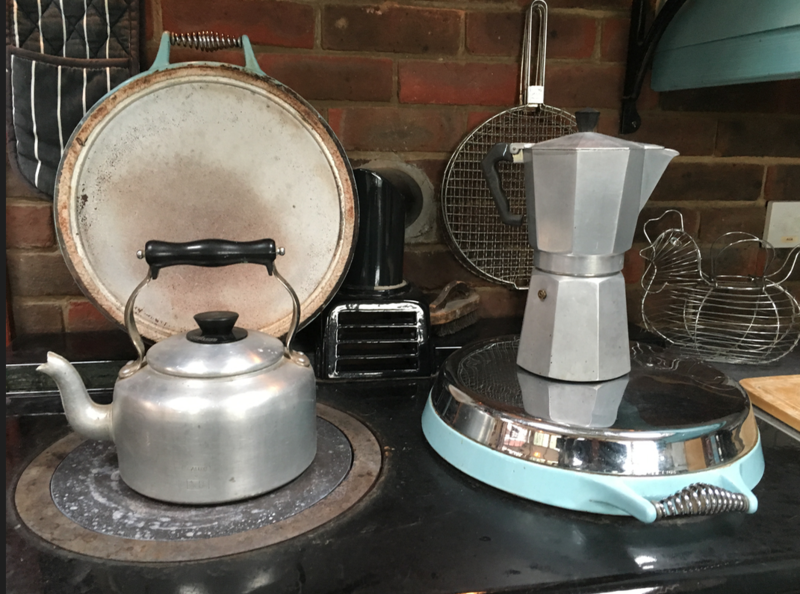 This entry was posted in New Forest, New Forest Commoner and tagged Aga, axe, caffè latte, Calf, Commoner, creature comfort, dairy, faggots, fire, foal, heat, logs, New forest, puppy, range, smoke, tractor, trailer, welcome, woodstove. Bookmark the permalink.